Have a question? Email us at clear@uconn.edu and mention the Advanced Viewer. Zoom in and out of the map using the + and - tools located in the upper left corner of the map. Alternatively, use the scroll wheel on your mouse. To pan around the map, left-click on the map and hold the left mouse button while dragging. Alternatively, use the Pan tool on the Map tab. If you get "lost" on your map and need to go back to the big picture, use the Initial View or Full Extent button on the Map tab. The left panel can be opened and closed using the chevrons located just below the toolbar tabs. The toolbar tabs can be opened and closed by toggling the toolbar icon. A Basemap draws below the other layers in your map. The Connecticut Base Map is visible by default. To change the basemap, click on the Basemap Icon in the lower left corner of the map and choose one of the options - Spring Aerial (from 2016), Summer Aerial (from 2016) and Hillshade (2016). 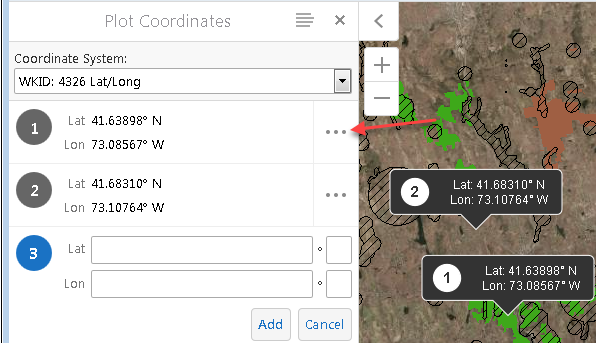 Although not technically listed under the basemap button, any of the Elevation or Imagery layers can be turned on in the Table of Contents and function as a basemap. The Open and Close Overview Map icon is in the lower right corner of the viewer. Click to open and show the map and click to close it. The Locate Me button adds your current location to the map and zooms to it. It includes a blue dot (the location) and a blue circle which indicates the margin of error of your position. Your actual location should lie somewhere inside the circle. Find Me: Pans the map to your location and marks the location with an indicator. This is the only option available in the desktop version. Track Me: Tracks your location with an indicator without panning the map. Only available in tablet and handheld versions. Follow Me: Follows your location with an indicator and pans the map as the your location changes. Only available in tablet and handheld versions. Please note that the Locate Me tools are only work when the viewer is accessed using the secure URL (https, not http). Check the address in your browser if the locate tool is not working. The Layer List is in the Layers panel on left side of the viewer. To open the Layers panel either click on the Layers tab in the lower left corner of the viewer OR click on the Layer List button on the Map tab at the top. 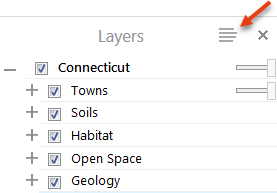 Layers are listed in Groups. Click on the plus to expand a group. The group needs to be checked in order for layers inside it to be visible . In this example, the Open Space Group is checked on as well as the Protected Open Space Mapping layer inside the group. The other layers are not visible. Expand as many groups as you like and turn on (check) any combination of layers. Remember that layers draw in order. Layers higher up on the list will draw above and on top of layers below. Layers often overlap so may cover each other up. If this is the case, use transparency or turn the layer off. Many layers have a chevron to the right of the layer name in the Table of Contents which opens the Layer Actions menu/panel. The panel contains options like Zoom to full extent (of layer), Zoom to visible scale (of layer), links to a Data Guide, Resource Guide, Metadata or other related information. At this time, raster layers like elevation and imagery do not have the layer actions option. To close the panel, click on the in the upper right corner. Transparency makes a layer partially or fully see-through. Transparency can be adjusted on some layers by moving the transparency slider next to the layer's name. It is important to be familiar with the layers before you use them for a particular application. Layer information is available for many layers through the Layer Actions panel in the form of guides and metadata. There are other informational pages in the CT ECO website that are relevant to certain layers, listed below. From the Layers panel, click on the Panel Actions icon at the top right of the panel. Click on Show Legend to open the Legend panel. The panel contains the legend for all layers that are turned on (checked) in the table of contents. To CLOSE the Legend, click on the at the top of the Legend panel to return to the Layers panel. Symbology, or the symbols used for a layer (which are also shown in the legend), can also be viewed in the Table of Contents. Click on the Legend info icon to the left of the layer name to show the legend. In the case where only one symbol is used in a layer, that symbol is visible instead of the legend information icon. Home returns to the initial home panel which includes basic instructions and a few links. Full Extent returns the map extent to the full view which is Connecticut and beyond. Initial View returns the map extent to the initial extent when the viewer first opened. If you have zoomed at least once since the viewer was opened, the Previous Extent button will take you back to the previous zoom area. The Previous Extent button can be used multiple times. After using the Previous Extent button to go back, the Next Extent takes you incrementally forward through already viewed extents. The Pan tool cancels any active tools and sets the cursor to pan around the map. Use the Bookmarks button to save specific extents during your session. Bookmarks make it easy to jump around the map to areas of interest. First, zoom to an area of interest then click the bookmarks button. Choose Bookmark Current Extent and give the bookmark a name. The named bookmark will remain in the list even while you move around and work with the map. The Layer List icon opens the Layer List panel. Use the Identify Tool to learn about what exists at a certain location. To start, click on the Point option and then click on the map. Note that Identify will only return information about features that exist in layers that are currently turned on or visible (visit the Layer List to change this). Two things happen when you click on a location. First, any features at that location are returned on the Identify Results panel which opens. Second, a red placemark is placed in the center of each feature that is listed in the Identify Results panel. Click on any feature on the Identify Results panel to see the attributes for that feature. The feature is highlighted on the map and the map extent changes to fit the extent of that feature. Click the to close the attribute panel and return to the Identify panel. Besides a point, the other identify options include freehand, line, polygon and rectangle as ways to choose what area will be used when identifying features. For example, draw a polygon around an area of interest to find all features that exist inside it. The Query button opens the Query panel to guide the query building. Choose the Data Source (layer) to query. The list is all layers that are available in the viewer. Once a Data Source is chosen, all available attributes are listed in the Select filter dropdown list. Choose one. Once an attribute is chosen, operators are listed in the Select operator dropdown based on if its a numeric or text field. Choose one. Finally, any values associated with that attribute are listed. Choose one. The choices together create the query. Click search to find all instances that meet the query. Each is listed with a pinpoint. Alternatively, view the results in a table by clicking on the Panel actions icon and choosing Switch to Table. The table is a good way to click on the results and view them on the map. To switch back to the list view, locate the Panel actions icon again and choose Switch to List. The menu also contains Buffer options and Export to csv, xlsx and shapefile. Multiple Queries - the Add Another Condition option allows for multiple queries to be constructed together. Edit Query - at any time, click on any of your query choices including the filter, operator or value (shown in blue) to make a change. Remove Query - click on the to delete a query. Filters allow you be selective about what shows on the map based on a defined set of criteria. 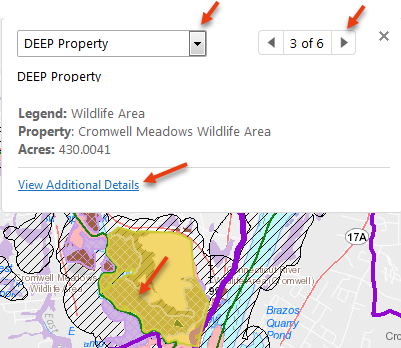 For example, you may only be interested in the State Forest areas that are part of the DEEP Property layer. Create the Filter by first choosing the Data Source or layer. The choices together create the filter. Click Filter. If you are viewing the layer, you will notice that only the features meeting the filter criteria draw. If you are not viewing the layer, nothing happens! But when you turn on the layer, you will notice that the filter is being used. Multiple Filters - the Add Another Condition option allows for multiple filters (on the same layer) to be constructed together. Edit Filter - at any time, click on any of your filter choices including the filter, operator or value (shown in blue) to make a change. Remove Filter - click on the to delete a query. The drawing tools can be found on the Draw tab. The point is visible by default. 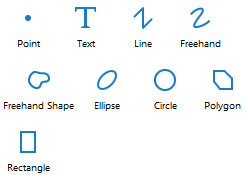 Click on the black down arrow to view the other drawing options including text , lines and shapes . With the tool activated, draw on the map. Double-click to finish the shape. Note that instructions are provided at the bottom of the viewer. Some tools allow snapping (check to Enable Snapping) so that any feature you "draw" may snap to existing features in any layer(s) you select in the Select Snapping Layers tool. The Styles button provides some options for changing the appearance of the drawn features. Drawings can be edited or change. First, click on the Edit button, then click on the feature to edit. Follow instructions along the bottom of the viewer to change the feature. When the Erase button is activated, clicking on a drawn feature will erase it. Clear removes all drawings. To export and download the drawings in shapefile format. Click on the drawing tool (point, polygon, etc.) again to unselect it and turn off drawing. The drawings will remain in your map until you exit the viewer OR either use the Edit options to Erase or Clear them. Select the Distance tool to measure linear distance and the Area tool to measure area. The Area tool can be found under the small black arrow next to the Distance tool. After one of the tools is selected, change the units if desired. Also Enable Snapping if desired. Then click on the map to create a line (distance) or shape (area) and double-click to finish. For distance, the total and length of each segment in the unit selected is visible. For area, the length of each segment as well as the total area and perimeter are returned in the units selected. Note that instructions are provided at the bottom of the viewer. To stop measuring, click the Measure tool again so that it is no longer selected on the toolbar. Any measurements on the map will be removed. The Plot Coordinates tool is under the Coordinates tab. After selecting the tool, the first step is to choose the coordinate system for the coordinates that will be returned. WKID stands for Well Known ID and is numeric way of cataloging coordinate systems. 4326 is a geographic coordinate system expressed in Lat/Long. The default 102100 listed is the native coordinate system of the map viewer. Other options include Connecticut State Plane NAD83 feet. Click on the map to place a point and display the coordinates. Click again to add another point. Notice that points are numbered on the map as well as on the Plot Coordinates panel. Alternatively, type in known x, y coordinates and click Add. Be sure the correct coordinate system is selected that matches your coordinates. If yours is not on the list, contact us (info below in the footer). Click on the 3 dots next to the point to be edited. The Coordinate Actions panel has several options including Hide Coordinate, Edit and Delete. Choose Edit, make any changes and Update. To stop adding points, click the Plot Coordinates button again so that it is no longer highlighted. The points remain until you exit the viewer OR choose to Hide or Delete all coordinates from the Plot Coordinates panel action menu . The left side of the footer ribbon holds the coordinates widget, the scale input box, and the scale bar. Click on the Coordinates Widget button to expand the Coordinates widget. Notice that clicking on the black triangle gives coordinate system choices. When you move the mouse over the map, the coordinates change. The Coordinate System page discusses the different coordinate systems in more detail, and the shortcuts section pertains to this viewer. Click on the Scale Input Box icon to expand the tool. Choose a per-existing scale. The scales are set following the Google/Bing tiling scheme. Right-click on any location on the map to see the latitude and longitude for that location. Click on the map and a pop-up opens containing information for any layer that is turned on AND has a feature in that location. If more than one layer has a feature at that spot, use the drop-down menu or arrows to flip through the features. View Additional Details opens a new panel containing all attributes associated with that feature. It also zooms to the feature. Close the panel with the in the upper right. To go back to the view before you clicked View Additional Details, use the Previous Extent button on the Map tab. For in depth identifying of overlapping features, try the Identify tool. Use the Search Tool (upper right) to find a location, place, address and more. Type into the Search window and press Enter. Search Results will appear in the side panel. Click on the result you wish to navigate to. The map will redraw with the feature centered on the map. Click the in the to remove the search results, or click on the Layers tab at the bottom of the side panel to view the Layers List. - Select Layout. The only option currently is 8.5 x 11 landscape. If you need another size, send us an email so we know what people want. - Output Format. The current choices are pdf and jpeg. - Map Scale. Choose one from the list. They options are based on the Google/Bing tiling scheme. - Add a Map Title. optional. - Add Your Own Notes. optional. Click Print. The file is created and the Open File button appears. Clicking it opens the map in the print template which includes the CT ECO logo, your title, an overview map, a legend containing the layers that are visible, a north arrow, scale, scale bar, your notes and a disclaimer. If you like the map, use your browser to save the file to your computer. Just a reminder that sometimes a screenshot does the job better than any prepackaged printing. The Export button opens the Export a Map Image dialogue. - Select Image Format. Options include BMP, JPEG, PNG, TIFF, GeoTIFF, PDF. - Include Georeference Data. Coming Soon! The Share button opens a list to share a link of your map including the current zoom level, extent and visible layers to either facebook, twitter, Linkedin, Google+ or email.